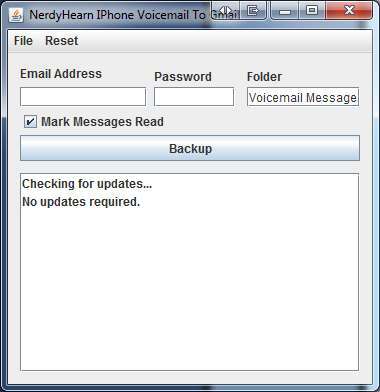 IPhone Voicemail To Gmail is a program which allows Windows and Mac IPhone users to upload their backed up Voicemail messages from their computer to Gmail or Google Apps. The program is available for a free trial limited to uploading 2 Voicemail messages so you can test the application yourself. The full edition allows you to back up an unlimited number of Voicemail messages to your Gmail or Google Apps account. Using IPhone Voicemail To Gmail is very simple. You first need to ensure that your IPhone is connected to your Windows computer using iTunes, in the same manner that you would normally synchronize your IPhone. Right-click on the device name, and select Backup. You can now close iTunes. Open IPhone Voicemail to Gmail, enter your credentials and your desired Gmail label, and the software will take care of the rest!